Californians have been besieged by ads, internet videos, and other media promoted by what appears to be a new crop of concerned citizens’ groups warning of the dire impacts of a supposed “hidden gas tax” on children, jobs, soccer moms, and low-income communities if the transportation fuels sector is forced to pay for its pollution beginning January 1. But, as a new report from NRDC shows, things are not what they seem. The oil industry has funneled more than $70 million into advancing its agenda in California since 2009, according to figures released just last week. That’s more than $3,000 per hour spent on lobbying in Sacramento from July through September, alone. NRDC’s report shows how Chevron, ExxonMobil, Shell, ConocoPhillips, BP—all members of the Western States Petroleum Association (WSPA)—and other oil industry players are supporting a series of front groups masquerading as grassroots consumer groups or broad-based coalitions. They’re using them to spread an extensive disinformation campaign about the next phase of California’s groundbreaking Global Warming Solutions Act (AB 32) going into effect in January 2015 that requires pollution reductions from transportation fuels – which represent almost 40 percent of California’s greenhouse gas emissions. A recent Bloomberg Businessweek article described the California Drivers Alliance campaign as “mirroring an oil industry claim” that AB 32 will “increase the cost of gas between 16¢ and 76¢ per gallon.” However, that allegation has been refuted as inaccurate and misleading both by the California Air Resources Board—the state agency implementing many of California’s climate policies—and by energy market experts. Some of the front groups have driven truck-mounted billboards around our state capital in an attempt to get lawmakers to back away from enforcing the January deadline for transportation emissions limits. The groups also have produced videos that, for example, feature a child and a soccer mom calling upon the public to rise up against California’s climate policies. California’s climate law, AB 32, which passed in 2006 and was overwhelming reaffirmed by the voters in 2010, requires greenhouse gas emissions to be reduced to 1990 levels by 2020. On January 1, California’s transportation fuel providers will join the state’s other major polluting industries (such as power plants and cement factories) under the cap-and-trade program, which places an upper limit on emissions and requires polluters to either reduce pollution or purchase a diminishing number of pollution allowances. 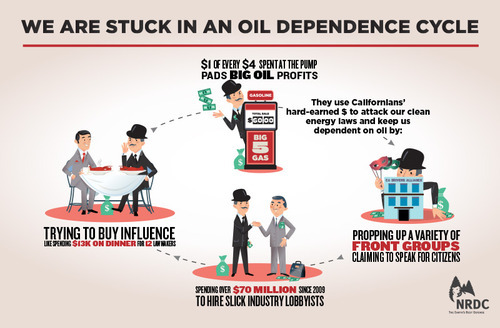 Instead of cutting emissions or investing in clean energy alternatives, Big Oil is mounting another effort to protect its market share and keep Californians dependent upon oil. Reducing pollution from the transportation sector is critical to achieving California’s climate goals and air quality standards. Many Californians live close enough to a freeway or busy road that they may face an increased risk of asthma, cancer, and other health hazards from vehicle pollution. In fact, twice as many Californians die early deaths from the health impacts of vehicular pollution than from motor vehicle accidents every year. This can especially affect low-income communities and communities of color, which are often located in regions with poorer air quality and closer to pollution sources. Although the front groups contend California’s climate policies will harm our most vulnerable citizens, the proceeds from selling pollution allowances will fund projects to cut emissions and improve air quality across the state -- and at least 25 percent of the funds must benefit California’s most disadvantaged communities, which are disproportionately affected by climate pollution. 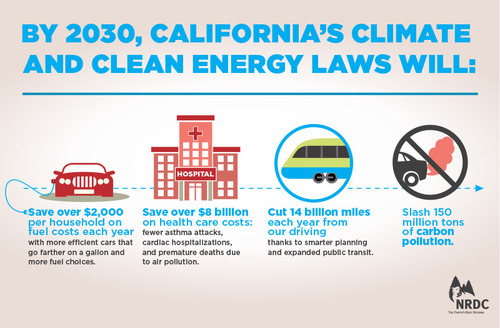 Thanks to AB 32, California households will save on average more than $2,000 each year by 2030 due to more efficient cars that go farther on a gallon, greater fuel competition, cheaper fuels like clean electricity, and better access to transit. We’ll also be driving 14 BILLION fewer miles and cutting 150 MILLION tons of carbon pollution, which benefits everyone. Big Oil believes it can hide behind slick marketing and scare tactics to avoid responsibility for its share of California’s climate pollution. But our clean energy policies cut dangerous emissions, boost the state’s economy, and drive investment in our most disadvantaged communities. Why should oil companies get a free pass when the state’s other major polluters are complying?